If you speak to a Sarawakian living overseas, you'll know that we treasure the laksa paste more than gold. Unfortunately, the only place to get this pot of gold is Sarawak, Kuching in particular. The paste is dark brown in color with a reddish tinge made of a mixture of various spices and chillies. It is boiled with water for 30 mins, filtered before adding coconut milk and seasoned with salt. Its accoutrements can be made several hours beforehand. This consists of rice vermicelli, egg omelete (cut into strips), beansprouts, prawns, coriander, chicken and served with lime. The folks in Sarawak would eat this for breakfast and generally the dish would be sold out by lunch time. The dish varies from city to city. The West Malaysian laksa has a curry base and it's creamier and lighter in color and served with egg noodles. In Penang, it's known as Assam Laksa because tamarind (assam) is used which gives it a sour taste. Needless to say, my favorite still remains the Sarawak laksa since I grew up eating it. My mother bought 10 packets for me and I'm down to my last. Anyone heading back to Kuching?? I used up my last two packets on Saturday. Kesian. Anyone going back to Kuching anytime soon? this looks absolutely delicious! i love laksa, all laksa. I cooked enough to last through 3 meals and enjoyed every morsel. I'm down to my last packet so I'm guarding it with my life. Chin, I'll save the last packet to cook for the family next week :)) Cheers !!! Li, savour your last pac of laksa for now !! Thanks Mi! 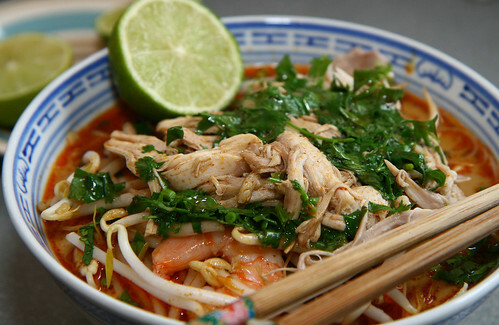 Looking forward to the laksa dinner next week!